That little peach butter cup ranunculus is out of control. Clearly this arrangement needs to be STOPPED. 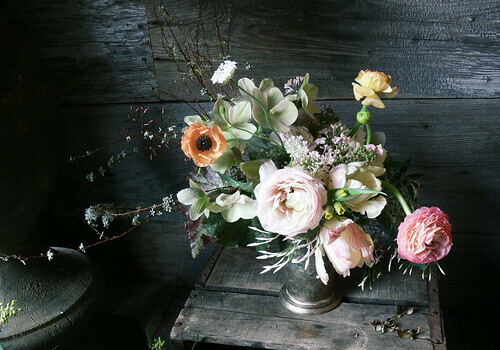 Did you know that the ranunculus is in the buttercup family? Such a sweet and gentle arrangement. Sublime. This looks like an Old World painting....Dutch, I think. Beautiful. shut UP with this! how do you keep just getting better? sara, truly, there are few things in this world more beautiful than your arrangements... sigh. No I didn't and I have just learnt something new. I can understand the obsession! The photo is stunning, really like a painting! whaaaa? buttercup family? mind = blown. i suddenly like buttercups so much more. Hi Sarah- I just saw these today and you should take a look, it might make you wet your pants a little. I think I did. Don't tell. What a beautiful photo! Really looks like painting.